Background At present, ovarian hyperstimulation syndrome (OHSS) is an uncommon and potentially life-threatening complication of ovarian stimulation. The ideal colloid solution for the treatment of patients with severe OHSS is still unknown. Human albumin, however, is considered the most ‘physiologic’ solution for this purpose and commonly used. However, severe life-threatening anaphylaxis has been reported with albumin infusion. The purpose of this study was to compare the efficacy and safety of hypertonic saline 3% for the treatment of severe OHSS rather than albumin. Patients and methods Over a period of 2 years, this randomized prospective study was conducted on 60 patients diagnosed with severe or critical OHSS admitted to Obstetric ICU of Ain-Shams University Hospitals. Patients were randomly allocated into two groups, each containing 30 patients. Group A (n=30) received 100 ml of albumin 20% over 4 h every 12 h plus conventional treatment according to the Ain Shams obstetric ICU protocol. Group N (n=30) received 500 ml of hypertonic saline 3% over 24 h (20 ml/h) plus conventional treatment. The efficacy of the study medications was compared in this study between the two groups in terms of daily urine output, serum creatinitine, percentage of occurrence established renal impairment, need of paracentesis, occurrence of established acute respiratory distress syndrome, and ICU length of stay. Results Significant difference was found regarding daily urine output among the study groups, with a significantly higher value (3350±142.6) in group N compared with group A (2150±133.4) associated with significant reduction in occurrence of established renal impairment in three cases in group A rather than 1 in group N. This is reflected by significant reduction in the length of ICU stay (3.1±1.1) in group N rather than group A (3.7±1.2). Conclusion The use of hypertonic saline 3% as a small-volume resuscitation is comparable to and effective and superior to albumin for the treatment of severe OHSS with regard to urine output, and may have a protective effect against occurrence of acute respiratory distress syndrome in such patients, but further studies are needed to prove that. At present, ovarian hyperstimulation syndrome (OHSS) is an uncommon and potentially life-threatening complication of ovarian stimulation. 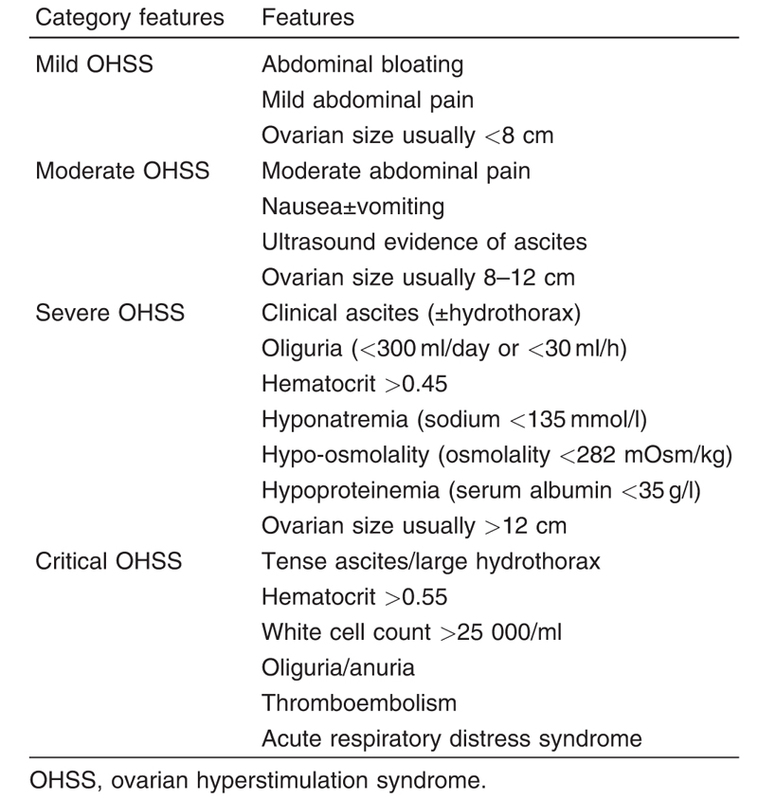 OHSS is an iatrogenic complication in almost all cases, the incidence of which is increasing worldwide through an increase in controlled ovarian hyperstimulation cycles . OHSS is a systemic disease resulting from vasoactive products released by hyperstimulated ovaries. The pathophysiology of OHSS is characterized by increased capillary permeability, leading to leakage of fluid from the vascular compartment, with third-space fluid accumulation and intravascular dehydration. Although decreased serum osmolality, sodium, and hemoconcentration have been described variously in established OHSS, severe manifestations include a tendency to develop thrombosis, renal and liver dysfunction, and acute respiratory distress syndrome (ARDS), causing serious morbidity . Currently, hypertonic fluid resuscitation seems to be an attractive choice for its theoretically physiological function. A variety of hypertonic saline solutions alone or in combination with colloids have been investigated as an alternative to both crystalloids and colloids in the resuscitation of patients in hemorrhagic shock. Animal experiments have identified several beneficial effects of hypertonic saline when compared with isotonic crystalloid solutions. In sheep, cardiac output, plasma volume, and urine output were significantly increased, whereas systemic and pulmonary vascular resistance was decreased . The aim of this study was to compare the efficacy and safety of hypertonic saline 3% for the treatment of severe OHSS rather than albumin in the term of the improvement of urine output and renal function. The prospective comparative randomized study was conducted at Obstetric ICU of Ain-Shams University Hospitals during the period from October 2014 to November 2016. The study protocol was approved by ‘research and ethics committee’ of Anesthesia and Intensive Care Department, Ain-Shams University. Informative consent was obtained from all patients or from their legal guardians before enrolling in the study. With respect to sample size calculation, it was calculated using PS (version 3.0.43, Department of Biostatistic, Vanderbilt University, Nashville, TN, USA) with the following parameters: urine output was used as the primary goal where power of the study was 80%, SD was ±2, mean was 20, and α error was 0.05. A total of 60 women were enrolled in the study, with a range of age between 24 and 40 years and were diagnosed as severe or critical OHHS (the diagnosis is based on clinical criteria, given a history of ovarian stimulation, either by gonadotrophins or antiestrogens, followed by the typical symptoms of abdominal distension, abdominal pain, nausea and vomiting) . Exclusion criteria for the study included patient refusal to consent (obsolete), preexisting neurological disease or psychic patients, history of cardiac and respiratory system failure, and coexisting renal or liver disease ([Table 1]). Patients were randomly allocated into one of the following two groups (30 patients each) using closed sealed envelope method of randomization. Rapid initial hydration by 500 ml of normal saline 0.9% and then 30 ml/kg/day, by intravenous intake. Heparin (5000 IU/12 h) as a prophylaxis against thromboembolism. Ultrasound-guided paracentesis for ascites if there is persistent oliguria in spite of appropriate fluid resuscitation or pulmonary compromise (hydrothorax, tachypnea, persistent low hypoxic index). This group received 500 ml of hypertonic saline 3% (manufactured by Egypt Otsuka Pharmaceutical Co., 10th of Ramadan City, Egypt) over 24 h (20 ml/h) for 3 successive days and conventional treatment for OHSS threatening according to the Ain Shams obstetric ICU protocol. On arrival to the ICU, all patients were continuously monitored with ECG, noninvasive blood pressure, and pulse oximetry. Urinary catheter was inserted if not already present, two wide-bore cannulas (at least 18 G) were inserted, and the central line was inserted when persistent oliguria with deterioration of renal function was detected. Baseline data and investigations were obtained, which included age, weight, serum E2 level, ovarian diameter, conception at the time of admission, arterial blood gas, urine output, complete blood picture, bleeding time, clotting time, prothrombin time, international normalized ratio, liver, renal function tests, and serum electrolytes. Oliguria at the time of admission was defined as urine output (UOP) less than 0.5 ml/kg/h for more than 6 h. Low hypoxic index was considered to be less than 300. Daily assessment of amount of ascetic and pleural fluid by ultrasound. Daily serum creatinine to detect renal impairment according to RIFLE criteria . Statistical analysis was performed using computer software statistical package for the social sciences (SPSS, version 17.0; SPSS Inc., Chicago, Illinois, USA). Description of quantitative (numerical) variables was performed in the form of mean±SD. Description of qualitative (categorical) data was performed in the form of number of cases and percentage. Error bars represent 95% confidence interval. Analysis of unpaired numerical variable was performed using the unpaired Student’s t-test, whereas analysis of paired numerical variables was performed using repeated measure general linear model analysis of variance. Analysis of categorical data was performed using Fisher’s exact test or the χ2-test, whenever appropriate. The significance level was set at P value of 0.05 or less, and P value of 0.01 or less was considered highly significant. The study groups did not differ significantly in terms of patient age or clinical presentation on admission, including ascites, pleural effusion, oliguria, mean ovarian diameter, hematocrit, levels of E2, serum Na, and fluid intake ([Table 2]). The mean daily urine output during the first 3 days of hospitalization was higher in group N rather than group A and was highly statistically significantly (P<0.001) associated with a significant reduction in occurrence of established renal impairment in three cases in group A rather than one in group N and needed fewer abdominal paracenteses. This is reflected by significant reduction on the length of ICU stay (3.1±1.1) in the N group rather than group A (3.7±1.2). In addition, there was no significant increase in serum Na in the hypertonic saline group. In all, nine patients presented with ARDS (four in group A, five in group N). No patient presented with thromboembolic events. Group N patients showed a decrease in the incidence of occurrence of established ARDS; however, this difference was statically insignificant. The ideal colloid solution for the treatment of patients with severe OHSS is still unknown, although human albumin is considered the most ‘physiologic’ solution for this purpose and is probably the most common one used. However, severe life-threatening anaphylaxis has been reported with albumin infusion . In the present study, we traced the advantage of using hypertonic saline 3% infusion to improve renal function and was comparable and effective and possibly superior to human albumin for the treatment of severe OHSS. The N group showed a statistically significant increase in urine output (3350±142.6) over 3 days in comparison with the A group (2150±133.4), denoting rapid improvement in urine associated with significant reduction in occurrence of established renal impairment in three cases in group A rather than one in group N and needed fewer abdominal paracenteses − 1 (30) in N group rather than 3 (30) in A group − denoting effective and rapid restoration of intravascular volume by using hypertonic saline rather than albumin. This is in agreement with the observation reported by Abramov et al. who conducted a controlled cohort study comparing the efficacy and safety of 6% hydroxyethyl starch and human albumin as colloid solutions for the treatment of severe OHSS on 16 patients with severe OHSS. Their results showed that patients who received 6% hydroxyethyl starch had higher urine output, needed fewer abdominal and pleural paracenteses, and had a shorter hospital stay than those who received human albumin. In each group, no adverse effects were observed. They concluded that 6% hydroxyethyl starch may be superior to albumin as a colloid solution for the treatment of severe OHSS. However, the use of intravenous hydroxyethyl starch to increase blood volume and revive critically ill patients was found to be associated with a significant increase in the risk of death and acute kidney injury, according to a study published in the February 20 issue of Journal of the American Medical Association (JAMA) . Huang et al. reported that the use of HS in burn patients produced significant increases in renal, pulmonary, and cardiac failure compared with the use of lactated ringer. In the present study, we notified that N group showed decreased incidence of occurrence of established ARDS rather than A group (0 and two patients, respectively); however, this difference was statistically insignificant. Petroni et al. demonstrated that fluid resuscitation with hypertonic saline decreased the progression of lipopolysccharide-induced ARDS in rat models owing to inhibition of pulmonary remodeling that is observed when regular saline is used. 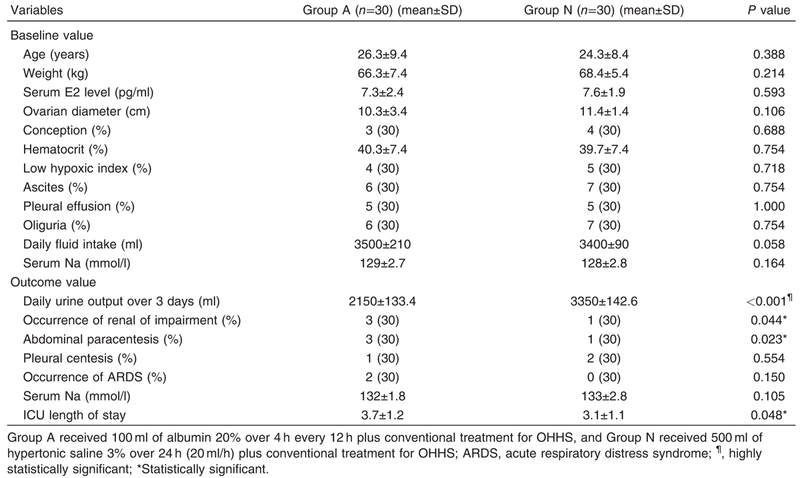 These results suggest that the use of hypertonic saline 3% as a small-volume resuscitation is comparable to, and effective and may be superior to, albumin for the treatment of severe OHSS with regard to urine output and renal function, length of stay in ICU, and may have a protective effect against occurrence of ARDS in such patients, but further studies are needed to prove that. Delvinge A, Rozenberg S. Epidemiology and prevention of ovarian hyperstimulation syndrome (OHSS): a review. Hum Reprod Update 2002; 8:559–577. Semba S, Moriya T, Youssef EM, Sasano H. An autopsy case of ovarian hyperstimulation syndrome with massive pulmonary edema and pleural effusion. Pathol Int 2000; 50:549–552. Nakayama S, Sibley L, Gunther RA, Holcroft JW, Kramer GC. Small-volume resuscitation with hypertonic saline (2,400 mOsm/liter) during hemorrhagic shock. Circ Shock 1984; 13:149. Mathur R, Evbuomwan I, Jenkins J. Prevention and management of ovarian hyperstimulation syndrome. Curr Obstet Gynaecol 2005; 15:132–138. Ranieri VM, Rubenfeld GD, Thompson BT, Ferguson ND, Caldwell E, Fan E et al. Acute respiratory distress syndrome: the Berlin definition. JAMA 2012; 307:2526–2533. Bell M, Liljestam E, Granath F, Fryckstedt J, Ekbom A, Martling CR. Optimal follow-up after continuous renal replacement therapy in actual renal failure patients stratified with the RIFLE criteria. Nephrol Dial Transplant 2005; 20:354–360. Komericki P, Grims RH, Abererl W, Kr€anke B. Near-fatal anaphylaxis caused by human serum albumin in fibrinogen and erythrocyte concentrates: case report. Anaesthesia 2014; 69:176–178. Abramov Y, Fatum M, Abrahamov D, Schenker JG. Hydroxyethylstarch versus human albumin for the treatment of severe ovarian hyperstimulation syndrome: a preliminary report. Fertil Steril 2001; 75:1228–1230. Zarychanski R, Abou-Setta AM, Turgeon AF, Turgeon AF, Turgeon AF, Turgeon AF, Turgeon AF. Association of hydroxyethyl starch administration with mortality and acute kidney injury in critically ill patients requiring volume resuscitation a systematic review and meta-analysis. JAMA 2013; 309:678–688. Huang PP, Stucky FS, Dimick AR, Treat RC, Bessey PQ, Rue LW. Hypertonic sodium resuscitation is associated with renal failure and death. Ann Surg 1995; 221:543–554; discussion 554-557. Petroni RC, Biselli PJ, de Lima TM, Theobaldo MC, Caldini ET, Pimentel RN et al. Hypertonic saline (NaCl 7.5%) reduces LPS-induced acute lung injury in rats. Inflammation 2015; 38:2026–2035.